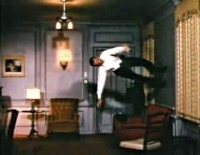 Of all the special effects in the history of movies, from Georges Meliés’ rocketship to the moon to Avatar, the one that always gets me most is Fred Astaire dancing on the ceiling to “You’re All the World to Me” in the 1951 film “Royal Wedding.” It is not because the dance number is any more or less spectacular than any of Astaire’s other amazing dance numbers in his astounding body of work, or that there is no way to figure out the techniques behind the photography that put the vision on the screen. What it is is the sense of possibility—that somehow we all can turn ourselves or be turned upside down in our lives, either as Astaire’s character is, by the ecstasy and joy of love, or by pain, sorrow, or change. The upside-down perspective itself can be terrifying, exhilarating, or both, even from just a physical perspective. Often we see it with little children, many love to get carried around the room upside down, or as my two-year-old niece, a true upside-down aficionado calls it, “uppie-down.” And there is a popular children’s television program called “The Upside-Down Show,” that airs on Nick Jr., where young viewers get to press imaginary remote buttons to help the show’s characters move in different directions, including upside down. But going upside down is not just for little children. Yoga practitioners often go upside down, and indeed teachers such as B.K.S. Iyengar (1966/1976) recommend some form of inverting the body as integral to daily practice, even including inversions in his own daily practice at the age of 93. He says “regular and precise practice …develops the body, disciplines the mind, and widens the horizons of the spirit (p. 190). The physiological importance for doing inversions is based on research done on zero gravity conditions. When the body is upside down, meaning the pull of gravity is reversed, the blood is thought to flow more quickly to the heart, and tissue and lymph fluids are thought to circulate quicker, enabling a better exchange of nutrients and wastes in the cells (Yoshikawa, 2000). But what of this inverted perspective? What does it mean to each of us experientially to be upside down? Merleau-Ponty (1962/2001) helps us try to understand this experience saying that at first we, as Beings-in-the-World, are concerned with our physical orientation in that world—our concrete relationship to things. He explains that these are expressed in directional terms—near or far, top or bottom, left or right, here or there. He discusses a case in which participants wore lenses that caused them to literally see the world upside down. On the first day, he said, “the whole landscape appears unreal and upside down” but on the second day “normal vision begins to reassert itself, except that the subject has the feeling that his own body is upside down” (p. 244). Over the remaining four days of the experiment, the participants gradually reorient themselves in space. Merleau-Ponty (1962/2001) then cites other studies by Wertheimer showing that not only can the body’s perception change with changes to the visual field, as in the experiments above, but also that the visual field can impose a completely different orientation on the body. He explains that this makes the body “a system of possible actions, a virtual body with its phenomenal ‘place’ defined by its task and situation. My body is wherever is there is something to be done” (p. 250). What this implies from a psychological perspective is that the body—and where the body goes, the mind usually follows—is very adaptable to changing orientations, or change period. So when we go around loosely dropping the phrase “This has turned my life upside down,” the picture may or may not be so bleak as a total reversal of fortune. It may simply be a total reversal of perspective. When our lives are turned upside down, our relationship to the world often changes, and sometimes we can use some of those same directional indicators to which Merleau-Ponty refers to show our shifting priorities—e.g., this concern has moved to the forefront, while that concern has moved to the background. But sometimes it feels more like a puzzle with pieces that are all the same color and we do not quite know where all the pieces are going to fit in our new landscape relative to us and to each other. However, Tedeschi and Calhoun (2004), who have written much in the field of posttraumatic growth, note that the same psychological processes involved in coping with negative emotions are those that can create positive change. Of course, in existential practice, a therapist would never try to draw a client out of his or her experiencing to actively push him or her into a so-called positive change for which the client is not ready. More often, this idea that trauma can be transformed is an idea the therapist can hold for the client until the client is ready to open to that possibility. A client who has experienced the process of inverting on a physical level may be more able—this would be an interesting hypothesis to test for future research—to cope with the experience of having their emotional lives turned upside down because they know from bodily experience that they can reorient themselves in the newly reformed landscape. Jenkins and Adams (2007) describe the existential therapist as the one who illuminates the “rope across the abyss” (p. 242). An embodied sense of even just knowing we have access to a rope to help get us across the abyss, a.k.a. the new landscape, if and when we might need it may be about as close to a sense of security any of us can get in this world of existential angst. That’s enough to make me want to go dance on my ceiling! Iyengar, B.K.S. (1966/1976). Light on Yoga. New York: Schocken Books. Jenkinson, M., & Adams, M. (2007). The ontology of change: Dilemma and tragedy as gateways to deeper meaning. Existential Analysis, 18(2), 230-246. Mercier, P. (2007). The chakra bible. London: Octopus Publishing Group Ltd.
Tedeschi, R. G., & Calhoun, L. G. (2004). Target Article: ‘Posttraumatic Growth: Conceptual Foundations and Empirical Evidence’. Psychological Inquiry, 15(1), 1-18. doi:10.1207/s15327965pli1501_01. Yoshikawa, Y. (2000, October). Everybody upside down. Yoga Journal [Online edition]. Retrieved at http://www.yogajournal.com/practice/214.